High-End cable cord organize box made with PU leather outer and flannel inner. Simple, aesthetic and elegant solution for cable and cord organizer. Reclaim lost floor and desk space by hiding power strip, unsightly cords, router cords, adapters, etc. Easily conceal and protect wires & power strip from children, pets, water, dust and accident. Designed with cable outlets at each end. 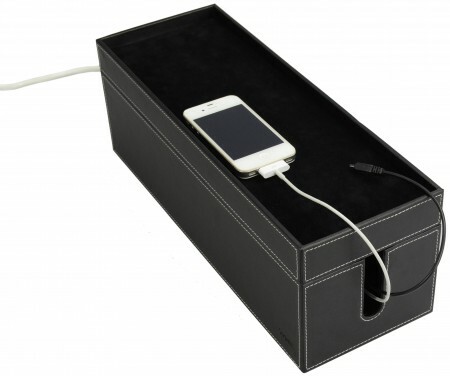 Size: 395 x 140 x 140mm / 15.5" x 5.5" x 5.5"
Surpahs Cable and Cord Organizer Box. Store power outlet, AC adapters, mobile chargers, network hubs and routers etc. in the box.